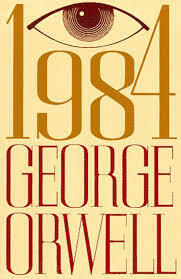 The book I chose for the 28th category on my reading list (a novel set during wartime) was 1984 by George Orwell. Because in 1984, there is always war. I despised this book. Hated it. I read books for the happy endings. [SPOILER ALERT] No happy ending here, folks. I kept waiting for the 11th hour surprise switcheroo. Never came. I usually enjoy dystopian fiction, even with cliffhanger endings. This? Did not fit the bill for me. In the interest of saying something of substance, it was written in such a way that I was intrigued, and kept reading. So I may have enjoyed the reading for a couple minutes in the middle? I kept reading. All the way to the miserable last four words. I also found myself quite thoughtful over Goldstein's explanation of how the world had ended up as it was being described in 1984. But that is a rather grudging compliment. I'm sure my bitterness will fade over time, but what was the book you read that you then wished you never had read? My big catch is that I NEEDED to read it, even to know that I would be this disappointed in it. So I suppose it was destiny that I would have to read it sometime. And now it's thankfully done. LOL funny that you hated it. I stopped reading leisurely.. Maybe I should start again!